A few months ago, the company that provides me with home Internet and phone service sold that portion (part) of their company to another business. Since then, there have been many news reports about service problems. I’m one of the customers who has been affected (felt the change or influence). Kimberly: What is the problem you’re having? Me: My Internet has been slow for the past couple of months. This morning, service was cutting in and out (sometimes working, sometimes not). And even when I have service, it’s running (operating) very, very slowly. Me: So I’m calling to get my Internet service fixed. Kimberly: Okay, what happens when you have no service? Me: Nothing happens. When I have no service, I have no service. Kimberly: I mean, are you not getting a dial tone (the stuttering (short, repeated) sound you hear when you pick up a telephone when its not in use)? Me: I have FiOS (a type of Internet service using “fiber-optic” wires). I don’t have dial-up (using a telephone line) Internet service. And I’m not calling about my home phone service. I have a problem with my Internet service. That’s what I’m calling about. Kimberly: [Long pause.] Do you have pets? Kimberly: Do you have pets? Me: No, I don’t have pets. Kimberly: Can you tell me what kind of router (device needed to send digital data, required for Internet service) you have? I am going to troubleshoot (solve common problems using established steps). Me: I’d like to get a service call (repair work done at the location). Kimberly: I’m supposed to troubleshoot, but if you request it, I can schedule it. Me: Yes, please order a service call. Me: All right. If they don’t show up (arrive as scheduled), is there a number I can call? Kimberly: You can call the number you just called. I have to tell you that if they don’t arrive by 8 a.m., the window (the time interval (beginning and end time) for arrival, usually for work to be done) is expanded (made longer) to 5 p.m.
Me: Excuse me? I don’t understand. Kimberly: If they’re not there at 8 a.m., then they will be there anytime between 8 a.m. and 5 p.m.
Me: [Long pause.] Okay, thanks. This entry was posted in Life in the United States, Technology. Bookmark the permalink. Believe me, here is much worse. I wish you have your problem solved. Interesting and actual topic. Before to read the post I was attracted by the painting “The Scream”. I know nothing about Norwegian painter EDVARD MUNCH (1863 – 1944). I have started to read on Wikipedia. 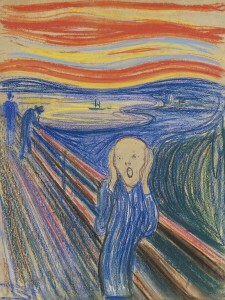 “The Scream” was sold for more than US$120 million in 2012. Using the Expressionism and Symbolism, his paintings are fascinanting. Maybe too many weeping women, sadness (Death in the Sickroom, Self-Portrait in Hell). I like his “kiss”, a total merger. Thank you for to reveal us this great painter and his paintings. Sure are you not telling us a movie of the Max Brothers?. with the five different phon companies I have been client for the fouteen last years. some of them have not any idea about their own work because in few days they will be out. in general, or what is even worst personal computers. Welcome to the club of angry people dear Lucy. in some of these phone companies. knowing nothing but paying them very low salaries. these large companies wants as much money as possible. When my internet service is sluggishly slow or acting up. I don’t immediately pick up the recover and call it in. I went through that milion times and have learned my lesson. I try to come up with a workaround of sth. If it fails I try to wait it out hoping the service will pick up in a few days. When it doesn’t happen which typically never does. Evey night , I sit by my bed and pray to God to make my speed up my internet service. Well , apperantly the reception in not good in this part of the world. As I never get any response from God. I reluctantly pick up the phone and reach out to customer service to help me out. First , they put through that ridiculously long voice prompt. U know , I mean one of those interactive voice response service systems. Man , it tskes u forever to press every keypad buttom the system command u to do. It feels like a gift from the sky. As you have to repeat all u said in the voice tromp for the real person. The rep on the other end always put me through a lot of technical jargons and steps to resolve the problems -air coding. Well ,needless to say , in 99.99 percent of cases it never works. Even my tenacious patient with thses people wears thin and I settle for the call service. They always schedule me , if I get lucky , for the following week -which mean another week woth no standard Internet service ,or at least what I promised when I signed the service agreement. They give u a 6-8 hour span in which they will show up to have a look-see at ur internet service and whatnot. So I need to hire sb to stay at my place or get a day off so i can sit around waiting for the Internet guy to show up. U end yo having a poor service for at least 10 days or so and interestingly enough , the Internet service bill at the end of the month reads the exact same amount u r being charged every month. It seems that I am a lucky person. 1st in Europe in terms of average Internet peak connection speed. We have the fastest Internet in Europe. Nine cities in Romania are among the top 15 cities in the world with the highest download speed. I have a “router” for Internet. We use the same word with the same meaning. Very funny ESLPodcast 1235 – Joining a Secret Society. For the phrase “protect each other at all costs”, we say “at any price”. And for “you’d take a bullet for each other”, we say ” I’ll protect you with the price of my own life”. Thank you for the explanation of the difference between “every” and “each”. “Are you the chosen one?”, that usually means you’re extra-special. The action continues in a Greek island. And his autobiography is a great novel. I read the both novels many years ago. Can you believe me? I forgot the name of the writer and the titles of his novels. I kept in my mind this phrase “Are you the chosen one?” as we do not have this concept in our literature as I know. Thank you if someone can help me. By my side I can´t say internet is slow now, no it is not, I have optical fiber so it is really fast. House of Cards, and other I have seen before. News are always more or less the same, and usually they are really very very sand and terrible. all destroyed, not to tell about Sirias´s war. So yes, optical fiber it´s fine, and Netflix it is fine too. etc. in Youtube, and having the opitcal fiber it´s easy of watching them without interruptions. Julia Roberts, takes the music of Berlioz. Thank you Waan LUU, we need blogers like you my friend.